For an absolutely wonderful and nutrient garden soil for all of your flowers and vegetables, try giving worm composting a try. It's easy and fun. Your daily organic leftovers and a few worms will make the best compost. If you reuse or re-purpose garbage cans, storage containers or wood pallets, the only investment may be earthworms. If you're feeling adventurous, you can actually dig for free earthworms. Though, you'll need about 200 of them. Earthworms digest organic matter and turn it into rich castings that plans absolutely love. It's easy to start a a worm composting system. Fill a worm bin half-full with bedding such as shredded paper, leaves or leftover vegetables and mix it with some soil or even sand. Then Moisten it. Bury vegetable scraps, cut flowers, used coffee grounds, newspaper, cardboard, rinsed and crushed eggshells, grass clippings or other foods like expired produce in the worm bin. Add about a pound of earthworms per pound of food matter. Keep the pile moist and replenish the food every week. In a few months the compost will be ready to use. 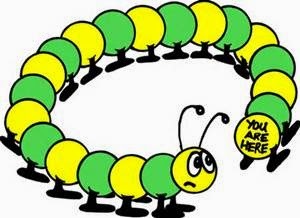 It's easy for a pound of worms to consume many pounds of vegetation. Earthworms can eat a few pounds of organic material overnight. You can feed your worms after you mow your grass, scraps from meals, shredded junk mail etc. Avoid putting citrus, dairy, meat, bones, onions and garlic, new coffee beans. These foods can actually either harm the worms or attract flies (maggots). Some folks don't like to put either potato or tomato plants or actual potato or tomatoes. They think if the plants were diseased it may cross contaminate the soil. 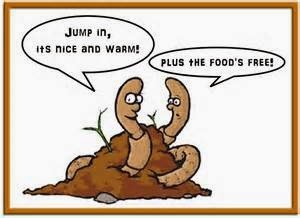 You can worm compost all year long even if you live snow bound regions. If your garage or basement is kept at a moderate temperature 50-65F. Be Sure to add air holes in the rubber container for air circulation. My First Bid was made from an old Rubbermaid rubbish bin. I didn't find it large enough for my needs. I also didn't like to have to sort through it for worms either. Drill large holes in the divider between both sides so that the worms can easily crawl through. It's easy to re-purpose and old wood pallet. You can even make 3 or 4 bins if you wanted to. You'll only need about 200 worms for a bin this size. 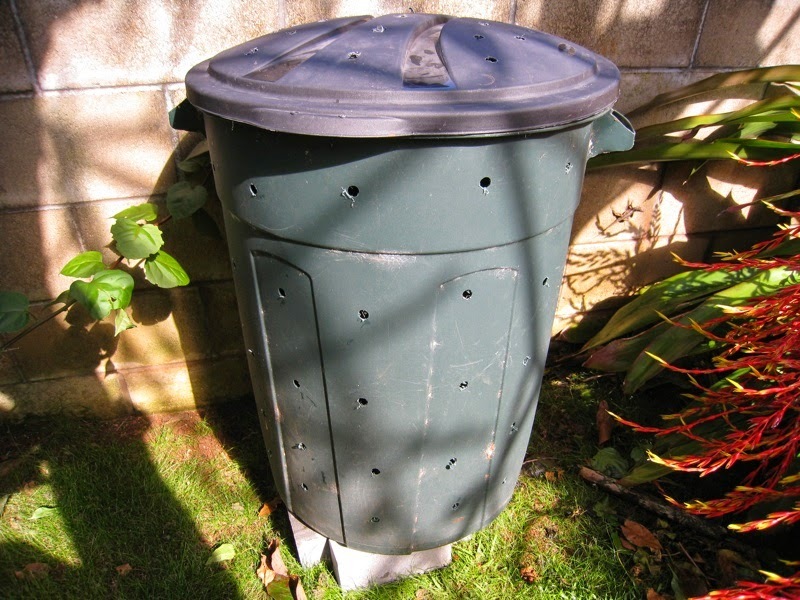 Worm composting bins can be made out of anything from garbage cans to wood pallets. Some folks like to use rubber garbage cans and be able to empty out the containers after most of the matter has been broken down. You'll have to sort through the compost by hand and gather the worms to begin again. Be sure to drill holes in the container for air. I find it easier to have two compartment container. You can re-purpose an old wood pallet to make a worm bin. 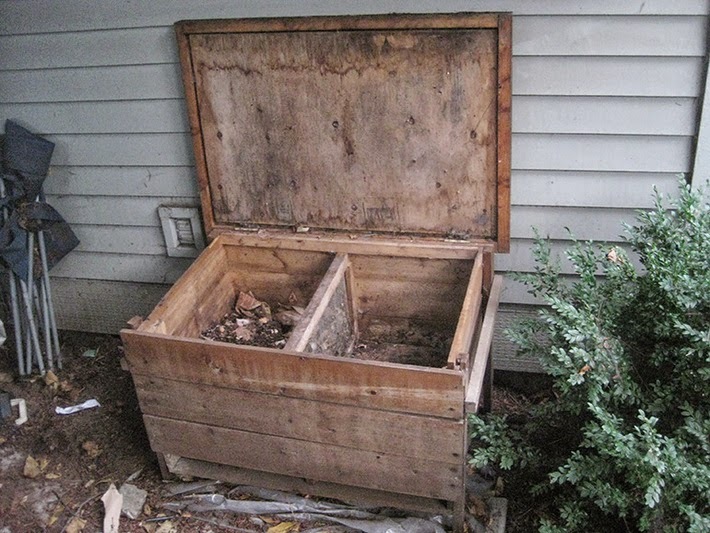 The divider between the two compartments should have large holes in it for worms to be able to crawl though it. Start by putting your organic matter or paper and soil one side. When most of the matter has been broken down by the worms. Start putting matter into the second side. The worms will actually crawl over to the fresh side. Wait for a few days before emptying out the first side after starting the new side. That will ensure that most of the worms crawled over to the second side with the fresh matter. You don't have to age compost after worms have broke down all of the leaves, paper, vegetables or what ever you put into the bins. The compost is ready to use. It's OK if a stray worm has been left behind and it went directly into your garden. You can easily buy worms and worm bins directly from the manufacturers at Amazon.com for about $80.00. They're light weight and easy to assemble. They also look much nicer than looking at a garbage can with holes in it or home made wood pallet bins. Here's a few links for you to look at. Here's a really good tutorial on Youtube. You'll learn more about what to feed your worms, where to get some free coffee grounds, worm digestive system etc. Composting using worms is easy and fun. It's a great learning experience for kids plus it's down right cool to them. There's nothing more exciting than ordering live earthworms. The anticipation of opening the box is downright fun whether you're an adult or a 12 year old kid. The ultimate benefit to using a worm compost bin is that it's a much quicker solution than having to keep churning and turning over organic matter in a traditional compost bin. Traditional composting can be quite heavy for those who don't have much arm strength. With traditional composting you're always having to turn over the matter. When composting using a worm bin, the worms do the work for you. Give worm composting a try. If you don't like it, you can always return your worms to the wild by putting them into your garden beds.